Below you will find clickable links to our application forms, as well as our tuition and fees, policies, supply lists, high school course selections, and summer camp information. If you have any questions, please do not hesitate to contact us by using the “Get In Touch” button at the top of the screen. Welcome to our online application system for new enrolling students and current students who are re-enrolling for the 2019-2020 academic school year. Please click on the following links below to be taken to our online application. Click here if you are enrolling as a new student into our Upper School (Entering Kindergarten through High School) for the 2019-2020 academic school year. Click here if you are re-enrolling a current student into our Upper School (Entering 1st Grade through High School) for the 2019-2020 academic school year. Tuition Discounts: Mosaic Academy cannot combine multiple tuition discounts. The Pay In Full tuition discount may not be combined with the Multiple Student Discount. The Multiple Student Discount may only be applied to our 12-month tuition payment option. Please note these are cash/check prices. 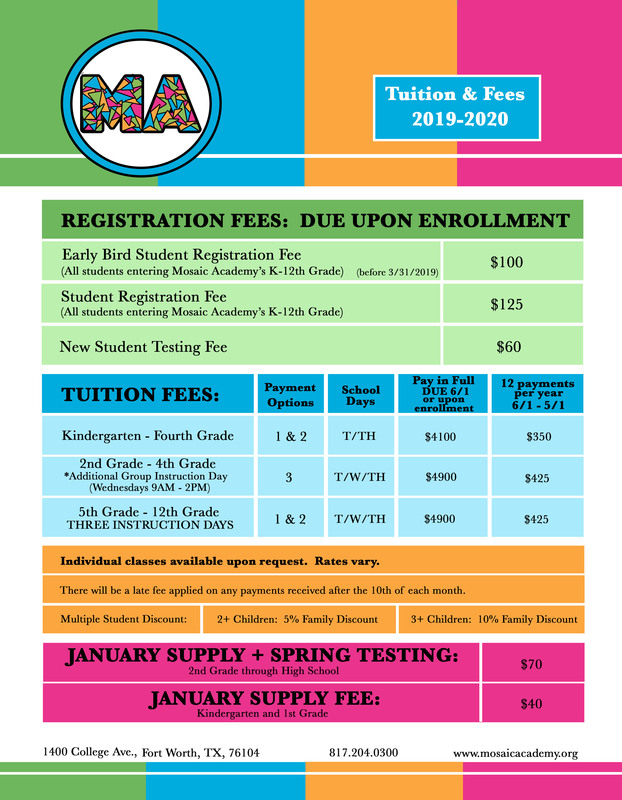 For credit card pricing, please call 817-204-0300 or contact the office at office@mosaicacademyfw.org. Enrollment is for the academic school year. Tuition is the same every month and is not variable due to holidays, bad weather, or days missed for any other reason. The fees are to reserve a place for your child, not for periods of attendance. Families can choose from several options for the right program for their child(ren). Class placement is determined by the child’s age as of September 1st. *Families may bring school supplies on Orientation night (August), or on student’s first day of school. Want to explore different cultures around the world and ignite your imaginations through science, technology, engineering, art and math? Join us for our summer Arts and Culture S.T.E.A.M camps Campers will rotate through different stations each day and participate in hands-on activities to boost their knowledge through these exciting subjects. It’s the perfect recipe for summer FUN! 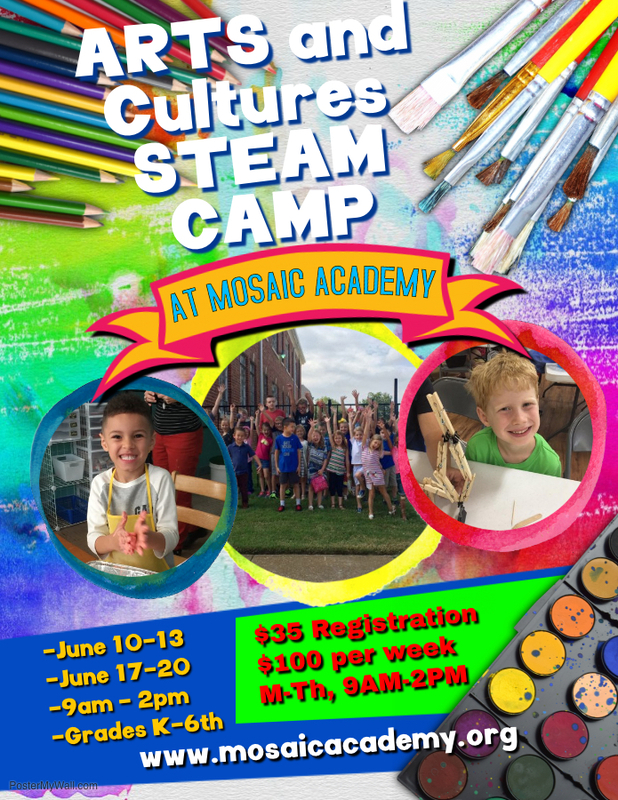 Click here if you are enrolling your child into Mosaic Academy’s Arts & Cultures Summer Camp. This camp is open to students entering 1st through 6th grade.